The new restaurant highlights Cebuano cooking’s Chinese and Spanish influences. Siblings Cybill, Marlon, and Malvin Tan didn’t open their first restaurant to serve Americanized versions of the dishes they grew up with. Cebu, which began service last week in Chicago’s Wicker Park neighborhood, is all about showcasing the nuances of Cebuano cuisine, which draws from both Chinese and Spanish influences. Before coming to Chicago, all three siblings were born in Cebu City in the Philippines and left at different times to pursue educations abroad; both Cybill and Malvin received degrees from Le Cordon Bleu, while Marlon attended Hult International Business School in San Francisco. Almost everything on the menu at Cebu, from the appetizers to the desserts, is designed to be shared, and many dishes have strong memories tied to the Tans’ childhood. At Cebu, traditional ingredients like kalamansi, soy sauce, and cane vinegar are commonplace, and chicken and pork are the proteins of choice. 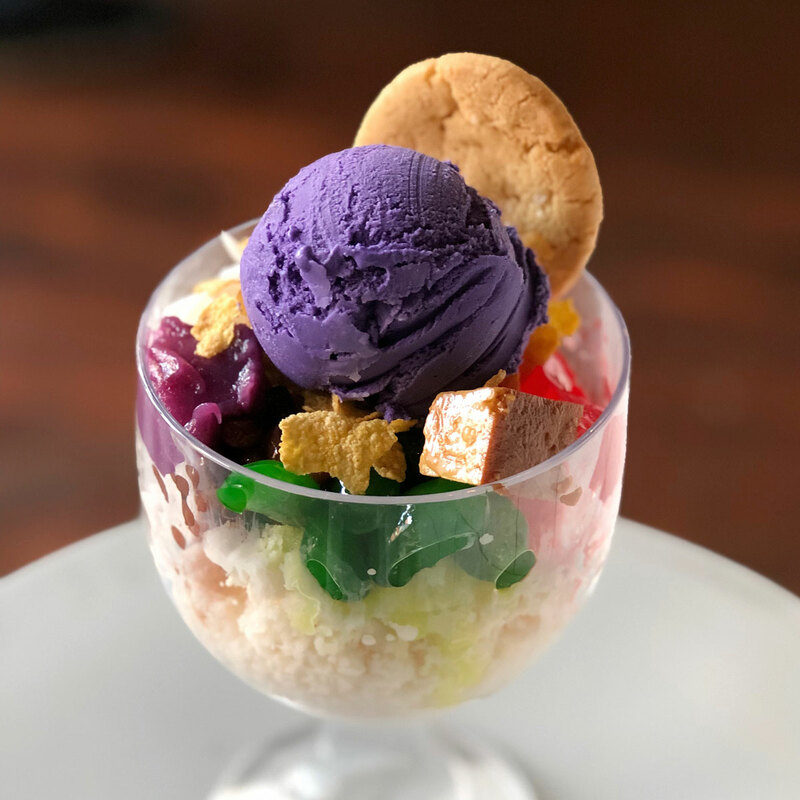 Pastry chef Cybill Tan is especially proud of her halo-halo (also known as “mix-mix”), a colorful dessert made with crushed ice, evaporated milk, fruit slices, chocolate, and ube ice cream. Cybill found that although Americans are used to a much runnier version of the dish, the halo-halo she grew up around was made to withstand the high summer temperatures of the Philippines. Accordingly, her take on the mix-mix is significantly less melty, which she says has surprised some guests, but will likely grow in popularity once summer hits Chicago. Meanwhile, Cebu’s ceviche uses less-common ingredients such as coconut milk, cane vinegar, and kalamansi. “We just really wanted to showcase what Filipino food could be, especially because it doesn’t have as much popularity as other Asian cuisines in the U.S.,” says Marlon. The Tans also created an ambitious cocktail program to familiarize guests with drinks that are commonly found in the Philippines. The Weng Weng, a mix of cognac, vodka, rum, tequila, scotch, rye, grenadine, and fruit juices, is especially popular. Over the next few months, the Tans intend to continue to riff on popular Filipino cocktails and dishes, but for now, Marlon says they’re taking it slow and looking forward to watching Chicagoans discover all of the variation that exists in traditional Filipino cuisine. Cebu, 2211 W North Ave, Chicago, IL. 773-799-8650.